These vary from 10km/h up to 110km/h. Times when limits apply can be shown on signs (e.g. 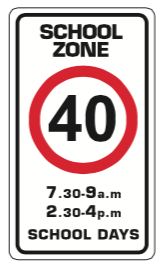 school zones), or the signs can apply for an area (e.g. area speed limits). Called ‘default’ limits, there is a ‘Built-Up’ Area limit and a maximum State Speed limit. 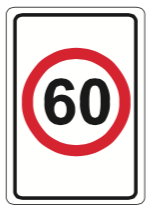 In a ‘built-up’ area, the ‘default’ speed limit is 50 km/h unless signed otherwise. The limit that applies in unsigned areas outside ‘built-up’ areas is 110km/h. This limit starts beyond signs such as a ‘derestriction sign’ or a speed limit sign with ‘END’ on it. 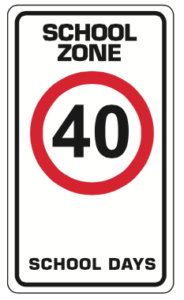 For speed limits lower than normal, a temporary speed limit sign may be installed for reasons such as poor conditions, work or events being undertaken. These temporary limits are for the safety of drivers and people participating in work or an event. 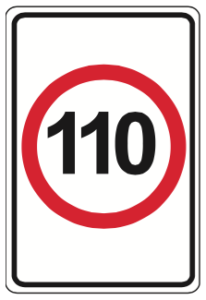 Do not exceed temporary speed limits shown on a sign. Speed limits are the maximum allowed under the best conditions. Drive slower when conditions dictate (e.g. the road is wet, winding, visibility is poor or traffic requires). Provisional drivers can drive up to 110km/h (where this is the limit), but should remember they are still gaining experience and need to take extra care. 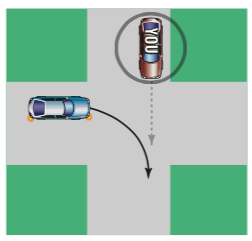 Maintain distance behind a vehicle to enable safe stopping in an emergency without hitting the vehicle in front. Most rear end collisions are caused by following too closely. The space or ‘cushion’ in front of you is called following distance. To determine required following distance, consider the speed of traffic and condition of the road. 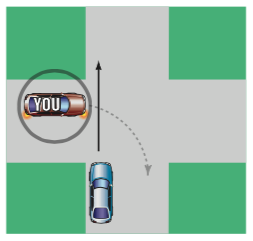 The ‘2 second’ rule can estimate an adequate following distance. 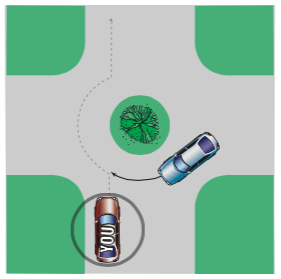 While driving look at an object by the roadside (tree or pole), that the vehicle ahead will pass. 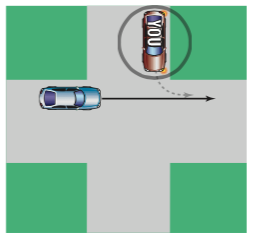 When the vehicle passes the object, count, ‘1001, 1002’. You should take the full 2 seconds it takes to say this to reach the object. If you get there before, you are too close. Slow down until you are at least 2 seconds behind the vehicle ahead. Remember that this ‘2 second rule’ is a guide for good road, traffic and weather conditions. If they are not good, increase your following distance to 4 or 5 seconds. Always allow a ‘cushion of space’ at the front, rear and on both sides of your vehicle. This is the margin for error you have in an emergency. The easiest ‘cushion of space’ to control is the one in front– make sure you always maintain a safe following distance. How long does it take to stop your car? reaction distance – the distance travelled from the time you realise you need to until you apply the brakes. An alert driver takes at least 1.5 seconds to react. At 60km/h you will travel 25m in this time. If you aren’t concentrating, your reaction time may be 3 or 4 seconds, and in some instances you may not react at all. braking distance – the distance travelled from braking until stopping. At 60km/h you will cover another 20m before this happens (on a dry road in a modern car with good tyres and brakes). When the road is wet, the braking distance will increase because braking hard on a wet road may cause you to skid. The distance will also increase if your tyres and/or brakes are not in good condition. stopping distance –total of reaction distance plus braking distance. Distance travelled once you react, brake, and stop. 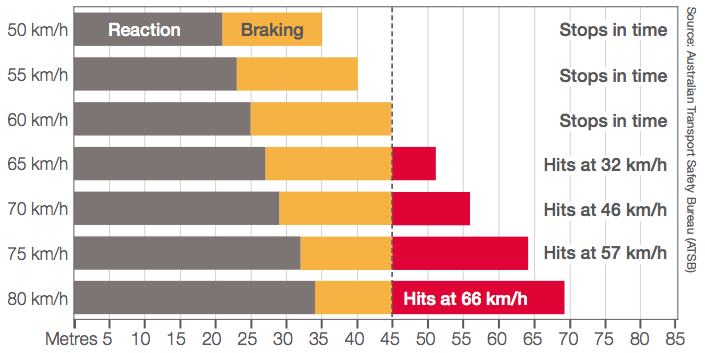 If you are doing 60km/h, add 25m to 20m (the best case reaction and braking distances) = 45m. road conditions – drive carefully over road surfaces covered with loose material or in poor condition. Adverse conditions increase stopping distances. Remember, the main factors that can influence stopping distance are your vehicle’s speed, the condition of your brakes and tyres and the road and weather conditions. On a dry day, in a new car with good tyres and brakes, you are driving when a child runs onto the road 45m ahead. The graph shows what happens at different speeds. How long does it take to stop a heavy vehicle? Heavy vehicles likely require more stopping distance. If you cut in front of a heavy vehicle and then brake suddenly (e.g. at traffic lights), you could cause a crash resulting in damage to your vehicle and injury to yourself and your passengers. The distance you see ahead and to the side is reduced after dark meaning it will take you longer to respond to hazards. About 1/3 of serious crashes occur after dark, so use extra caution to allow for the reduced visibility. Use your headlights between sunset and sunrise or when conditions require. You need good visibility to drive safely and it is equally important for others to be able to see you. Drive so you can stop within the area lit by your headlights. Your headlights light ahead, not around corners. When entering curves at night, slow down and drive carefully. To alert a driver you are about to overtake you are able to briefly switch your headlights to high beam when approaching another vehicle from behind. Be especially observant while in the rain as pedestrians and cyclists can be hard to see. It takes longer to stop in the wet, so you should at least double the following distance to the vehicle in front when the road is wet or visibility is poor. The ‘keep left’ rule on these roads means you must keep as far left as practical, especially when turning left or going up a hill. (Motorcycle riders are exempt from this requirement and may ride away from the left side but left of the road centre). If driving a slow moving vehicle, pull well over to the left to allow traffic to overtake. 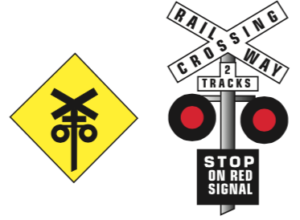 Railway crossings are dangerous, especially if no flashing lights or boom gates.Trains cannot stop quickly even under emergency brakes. 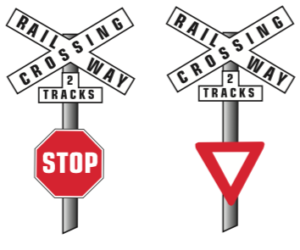 A train can take over 1km to stop and cannot swerve to avoid a vehicle. Always look for railway crossing signs. 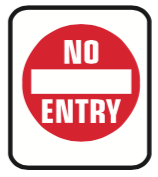 If there are no lights or boom gates, look and listen and be prepared to slow down, give way or stop. In country areas, always look as trains are not always on schedule. Obey all the traffic rules stated on any crossing signs. If there is no ‘STOP’ line or sign, stop well clear of the crossing (at least 3m from the nearest rail). Remember the train can be up to 1m wider than the tracks on both sides. 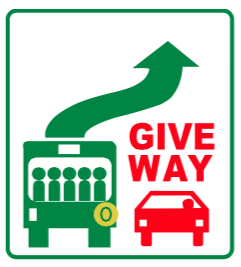 Give way to a bus moving out from a bus stop in a ‘built-up’ area if the bus is indicating and has a ‘GIVE WAY’ sign displayed on the back. Bus lanes are reserved for public buses. In some instances taxis are also permitted. Do not drive in a bus lane or a bus/taxi lane unless leaving or entering a road, passing a turning vehicle or an obstruction. Give way to vehicles already in these lanes before you cross or enter them. Floodways and river crossings are dangerous. Do not cross if water is too deep or fast. Inexperienced drivers should use an alternative route if available. If no alternative, before crossing water (e.g. floodways, streams or rivers) always check the depth by getting out and walking the intended crossing if safe. If the water is not flowing, the water level should be no higher than the bottom of the vehicle on conventional 2 wheel drives and no higher than the average adult’s knee (when standing) on higher 4 wheel drives. If the water is flowing and deeper than the bottom of the vehicle, do not cross. Regulatory signs control traffic and must be obeyed. Alert you to possible danger. Generally yellow with black lines, writing or numbers. Pedestrian warning signs are usually red-orange. Slow down when you see one. Advisory speed signs can accompany warning signs (e.g. approaching curves/bends). You should slow down to at least the signed speed (even slower in wet weather). Guide signs help you find your way around. They give directions, distances, routes, and information on road user services and points of interest. These signs warn about temporary hazards. They are used where road works are in progress. They protect people working and driving, guarding against vehicle damage and protecting the road. Pay particular attention to changed speed limits attached. Broken lines mark lanes for traffic in the same direction or dividing lines on roads. A broken white line means you may cross to overtake or change lanes, provided it is safe. Single unbroken lines mark edge lines, lane lines or dividing lines (centre lines). 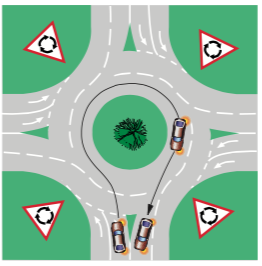 Where single continuous line is a centre line, do not cross except to leave/enter the road, turn at an intersection or ‘U’ turn. Where the line is a lane line, do not cross the line to change lanes. Where the line is an edge line, you may cross to stop, enter or leave a road, or pass on the left side of a vehicle turning right. These lines are used as dividing lines (centre lines). Do not cross these lines to overtake but you can cross them to turn right at an intersection, ‘U’ turn or enter/leave a road. Combinations of these lines mark dividing lines where it may be dangerous to overtake. A continuous line on your side of the road and a broken line on the other side means you must stay to the left of both lines. If the broken line is on your side, you may cross the lines to overtake, turn right, ‘U’ turn or enter or leave the road if it is safe. When two lanes merge into one (might also be indicated by signs such as ‘LANE ENDS MERGE LEFT‘ or ‘LANE ENDS MERGE RIGHT’ or ‘FORM ONE LANE’, or symbolic warning signs) you must give way to vehicles in any way ahead of you. Indicate you are merging by using your indicator or hand signal. Keep a safe distance between vehicles and take turns to merge in long lines of traffic. You must drive in the direction of arrow markings unless you are able to change to another lane where another direction can be followed. When the children’s crossing guard extends the flags, you must stop before the stop line if there is one and wait until the flags are removed before driving on. Do not enter a children’s crossing if the road beyond is blocked by traffic. You must give way to all pedestrians on a pedestrian crossing. Painted zigzag lines can indicate you are approaching a pedestrian crossing. Do not stop your vehicle on road that has the words ‘KEEP CLEAR’ written on it. A ‘NO STOPPING’ area may be marked with a single yellow line on the road edge. Do not stop a car next to or on a single yellow line unless you are held up by traffic. Traffic control signals regulate intersection traffic by deciding who goes and who stops. It is an offence to disobey signals. When nearing signals, be prepared to stop. 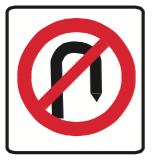 Do not do a ‘U’ turn at a traffic light unless a ‘U TURN PERMITTED’ sign allows. Traffic control signals always have the coloured lights in the same order. When the light is red, wait behind the stop line marked near the signal. If there is a traffic sign facing you with the words ‘LEFT TURN ON RED PERMITTED AFTER STOPPING’, you may turn left, if safe. Give way to pedestrians and other traffic. Remember, always stop at the red light first. A yellow light warns the signal is about to change to red. If the light is yellow as you approach you must STOP, IF YOU CAN DO SO SAFELY. When the light is green, proceed through provided it is safe. Watch out for vehicles disobeying signals as vehicles driving through red lights cause crashes. Watch out for pedestrians who may still be crossing the road. A flashing yellow light indicates the signals are not working properly. Do not confuse these with Pelican Lights that provide safe crossing for pedestrians. If there is a flashing yellow light, treat the intersection as if you have a ‘GIVE WAY’ sign facing you. The same should be done if no light is displayed at all - slow down and be prepare to stop. Some traffic control signals have arrows in addition to circular lights. Arrows control the movement of turning traffic. If turning, obey arrows pointed in your intended direction. Do not go straight ahead. You may turn in the direction of the arrow, if safe. Always give way to all pedestrians crossing at the intersection. You may go straight ahead or turn in the arrow’s direction, if safe. If the green arrow disappears and no red light or arrow appears, you may proceed – only if safe. You may go straight ahead, if safe. You may not turn in the arrow’s direction. A pelican crossing works like normal traffic control signals, except there is an extra phase – a flashing yellow light (not to be confused with lights that are not working). The flashing yellow light at a pelican crossing means ‘PROCEED WITH CAUTION’. You may proceed, unless pedestrians are crossing. If there are, you must give way. During unusual traffic flows, or if the power is cut, police or authorised persons may be on duty to ease traffic flow. Get into the correct lane and indicate clearly. Indicators and hand signals are an effective way to communicate. Stopping, changing lanes or turning without letting others know can cause problems. Be consistent and considerate by using indicators/signals at the appropriate times. You must signal your intention to stop using brake lights to warn other road you are slowing down. Brake lights must be clearly visible at all times up to 60m. 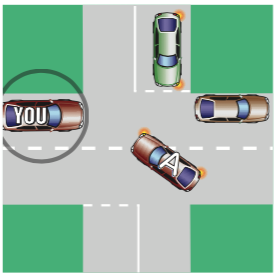 You must give sufficient warning of your intention to turn, diverge, change lanes or overtake. ‘Sufficient warning’ depends on circumstance but should be enough so other road users can take appropriate safety precautions. On high speed roads, ‘sufficient warning’ may be necessary for several hundred metres, while on low speed roads much less may be sufficient. If starting from a stationary position at the roadside you must indicate for at least 5 seconds prior to moving. You must also give way to following or overtaking traffic. Do not drive until it is safe and turn the indicator off after the movement is complete. Must be used if a vehicle is not equipped with stop light or flashing indicators. 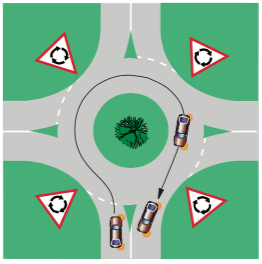 Roundabouts have several exit points. Enter only when there is a safe gap in traffic. When turning left at a roundabout, approach from the left lane, indicate left, stay in the left lane and exit in the left lane. 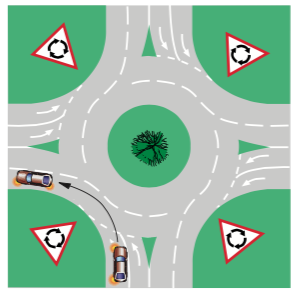 When turning right at a roundabout, approach from the right lane, indicate right and stay in the right lane. Indicate left, if practical, as you are passing the exit before the one you wish to use. 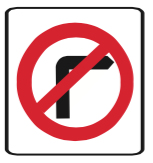 When leaving the roundabout, exit in the right lane. 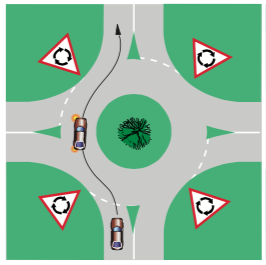 You do not need to indicate when you are approaching a roundabout if going straight ahead. Unless the road markings show otherwise, approach from either the left or right lane and drive in that lane throughout. Indicate left if practical, as you are passing the exit before the one you wish to use. Exit in the same lane in which you entered (exit in the left lane if you entered in the left lane or the right lane if you entered the roundabout in the right lane). 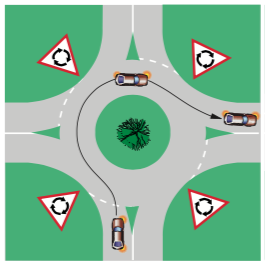 If you are using the roundabout to make a full turn (‘U’ turn), follow the instructions for turning right. 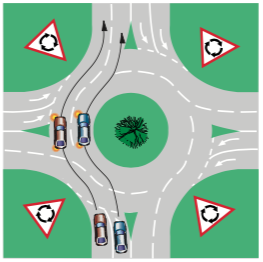 Generally, take care when you drive in a roundabout, especially when changing lanes and leaving. Watch out for vehicles leaving the roundabout, vehicles making a full turn, and bicycles, long vehicles and motorcycles. Before you drive on a freeway, make sure you are confident drive at freeway speeds. check your mirrors frequently and your blind spots before changing lanes. indicate/signal well before you change lanes, enter/leave the freeway. Give way to traffic in the lane you are moving into and move smoothly. be smooth and courteous when merging. Give way to vehicles with any part ahead of you. Maintain a safe distance in front. lookout for directional signs so you are prepared to get into the correct lane. Move into the lane when practical but remember not to use the right lane unless overtaking or lanes are congested (where freeway limit is 90km/h or higher). in reduced visibility (rain, fog or smoke) reduce speed and increase following distance. Turn your headlights on to low so others can see you. if your vehicle breaks down on a freeway, pull into the emergency stopping lane or nature strip. Use your hazard lights, stay away from traffic. Be careful when you re-enter traffic. Give way and indicate for at least 5 seconds before moving. be sure your vehicle is roadworthy, has enough fuel, and any load is secure. plan your journey – know your entry/exit points. adjust your speed as you drive along the entry ramp. make sure you are not entering the freeway at a sharp angle. drive so you merge smoothly with traffic. clearly signal your intentions. Indicate before and while merging. Turn off your indicator when the merge is complete. Freeways are designed for higher speed traffic flow than standard roads. Driving too slowly can cause dangerous situations, so to travel at a speed no more than 20km/h below the posted limit (unless conditions prevent you from doing so). Select the correct lane and indicate your intention to leave in advance of the exit. When safe, move gradually but positively into the exit lane. Slow down when entering the exit ramp and adjust your speed to be prepared for driving in suburban or city conditions. Pedestrians and cyclists are not allowed on freeways except on paths. 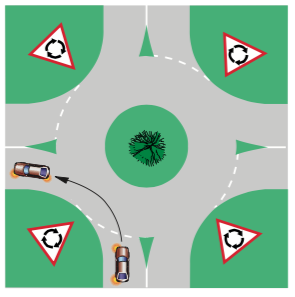 The rules for the different types of intersections help to reduce their danger. Traffic control signals - be prepared to stop if the light changes to yellow or red. 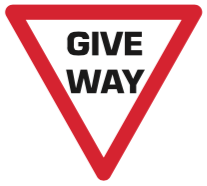 ‘GIVE WAY’ sign - give way to traffic on or turning from the intersecting road. 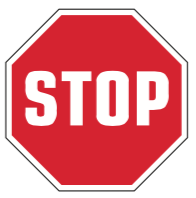 ‘STOP’ sign - stop and give way to traffic on or turning from the intersecting road. Stop at the line marked across the road before ‘STOP’ signs. If you have to stop back from the line, stop again as close to the line as you can when you move forward. If there is no line, stop as close to the intersection as practical but before entering it. 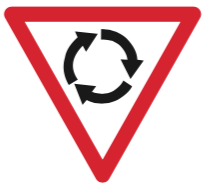 Give way to all traffic coming from the left or right, including turning vehicles. 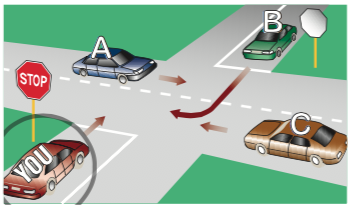 In the image, YOU must give way to Car A and Car C. Car B must give way to YOU, Car A and Car C.
When a Police officer or authorised person is directing traffic, take direction from them as their directions overrule traffic control signals and signs. If their back is towards you, stop your vehicle and wait for instructions before driving. 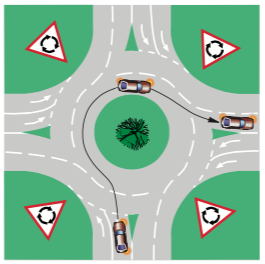 Uncontrolled intersections are all others apart from those mentioned above. If you are turning right at any uncontrolled intersection, give way to oncoming traffic travelling towards you or turning left. always travel in a clockwise direction. Do not enter an intersection when a queue of traffic prevents you from fully exiting on the other side. Stop before you enter the intersection so that you do not block crossing traffic. 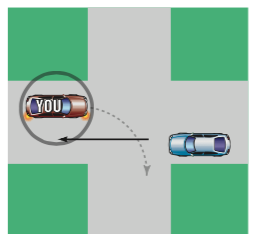 In the diagram, YOU must stop before the intersection. This allows vehicles such as Car A to cross the road. Ensure that a turn can be made without interfering with the progress of oncoming vehicles. While waiting to turn, keep the wheels in the ‘straight ahead’ position because if you’re struck from behind, you will not be pushed into the path of oncoming traffic. When to indicate/signal your intention to turn? Give as much warning as possible. ‘Sufficient distance’ depends on the circumstances. If travelling at high speed, a sufficient distance may be several hundred metres. Turn only when you can see clearly – large vehicles may block approaching traffic. If someone you indicates they wish to change into your lane be polite and let them in. Overtaking is one of the most dangerous manoeuvres. Overtake if safe, wait if unsure. Do not exceed the speed limit or cross continuous line/s to overtake. You can overtake on the right when travelling in the same direction and it is safe/legal. Reversing is difficult for drivers of large vehicles, so give them plenty of room. REMEMBER: If you can’t see the driver’s side mirrors, the driver can’t see you. be patient and stay back several car lengths without crossing the road centre. when safe - indicate, move out, accelerate and overtake quickly and positively, keeping in mind the road, visibility, weather conditions and speed limit. use your left indicator when you are about to return to the left. after overtaking, maintain your speed. Do not overtake and slow down. 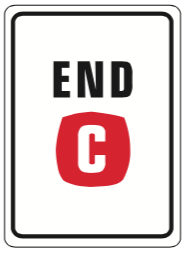 allow for oncoming vehicles that may be travelling faster than you think. Only overtake when the road clear - waiting could save your life. never attempt to overtake a large vehicle on a curve/hill where visibility is limited, even when the vehicle is moving slowly. make good use of overtaking lanes to overtake large vehicles. be ready for the wind buffeting you as you pass. be extra careful after dark. many oversize vehicles are accompanied by a pilot vehicle with two rotating yellow lights and warning signs on its roof that usually travels in front. pilot vehicles warn approaching drivers. Slow down until the oversize vehicle passes or stop if directed by the pilot vehicle driver. cooperate with the pilot vehicle driver when they signal you to move over as the oversize vehicle may need to be in the centre of the road. if you move off the bitumen, slow down and watch for guide posts that indicate a deep culvert. Use extra care if the road’s edge is wet. To ‘park’ means to remain stationary whether the vehicle is attended or not - except for the purpose of avoiding conflict with traffic, complying with another law, or picking up or setting down passengers or goods (for a maximum of 2 minutes). 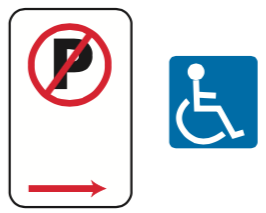 in parking bays for people with disabilities (misuse can result in a fine). 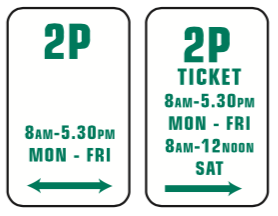 Bays marked with the symbol shown are reserved for holders of a current ACROD parking permit. When you leave, apply the park brake, remove the ignition key and lock the doors. When parking in a two-way street, park close to, and parallel with, the left boundary of the street. Unless signs say otherwise, you may park on either side in a one-way street. A good idea is to turn your wheels towards the kerb so that the kerb will help stop the vehicle if it does move. After you park, look out for traffic, especially cyclists, and wait until it is safe before opening the door. If there is too much traffic, it may be safer to get out on the side of the vehicle away from the traffic. Clearways are sections of roads where vehicles cannot stop during certain times. Clearways allow the traffic to flow more easily during peak traffic periods. How do you know which roads are clearways? 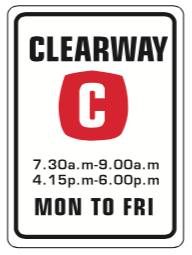 Clearways are marked by a sign with a large white ‘C’ on a red shield or on a parking meter. The times stated on signs tell you when you cannot park. This is usually during the morning and/or evening peak traffic periods. What happens if you park when you are not supposed to? Parking your vehicle in a clearway will slow down traffic flow. Penalties are high and can include heavy fines or your vehicle being towed away.